This largest of the Borders towns is located at the confluence of the Slitrig Water with the River Teviot, 12 miles (19 km) south of Selkirk and 21 miles (34 km) southwest of Kelso in the old county of Roxburghshire. Hawick remains one of Scotland's leading textile centres, famous for its knitwear and hosiery. Its rivers have given power to its mills, but also brought flooding, most notably in 1846, 1903, 1938, 1953, 1963, 2005 and 2015. The historic core of the town is situated on flat ground close to these rivers, while later extensions occupy the surrounding slopes. In the late 12th C. the town was a barony belonging to the Lovel family but this passed to the Douglases of Drumlanrig after the Wars of Independence. The town was erected into a free Burgh of Barony, probably in the mid-15th C. but formalised by a charter dated 1511. It has a long tradition of civic independence, reinforced by the burgh's Common Riding in June, the largest of its kind in the Borders, which can be traced back to 1703. A month of celebrations marks the events of 1514 when a group of youths (callants) defeated an English force at Hornshole and captured their standard, known as the 'Banner Blue'. The day of the Common Riding involves the inspection of the marches (boundaries) by mounted townsfolk, while the town is bedecked with distinctive blue and yellow ribbons and pennants. The Hawick Callants Club was founded in 1903 to perpetuate local customs and traditions, and is central to the common ridings events, along with the Ancient Order of Mosstroopers and the 1514 Club. Hawick has long been a centre for textiles, with hand knitting preceding the introduction of frame knitting in 1680 though this was fully commercialised only in 1771 by local magistrate John Hardie. By 1820, the area had about half of all Scottish frames and after mid-century the focus on stockings shifted to woollen underwear and then, in the 20th century, to women's knitwear. Hawick was once an agricultural centre; Hawick Auction Mart was one of the oldest in Britain, established in 1817, but it closed in 1992 and the site was redeveloped as a supermarket. The railway came to Hawick in 1849 with the opening of the Waverley Line from Edinburgh. The station was moved in 1862 to allow the railway to be extended to Carlisle, but the line closed in 1969. This left Hawick with the dubious honour of being the British town furthest from a railway station, the nearest being 38 miles (61 km) away at Gretna Green. The site of the old station was redeveloped in the 1980s to become the Teviotdale Leisure Centre. 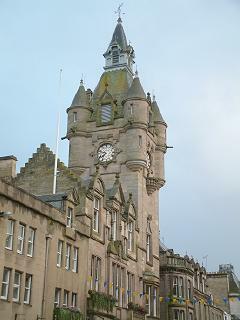 In the town centre, three historic buildings now form the Heart of Hawick tourist attraction; namely the Borders Textile Towerhouse, Tower Mill and Hawick Heritage Hub. Hawick Balls are buttery mint sweets favoured by the late rugby commentator Bill McLaren (1923 - 2010), who lived in the town. Other notables born in Hawick include James Wilson in 1805, who founded The Economist, composer Francis George Scott in 1880, yachtsman Sir Chay Blyth in 1940, actor Peter McRobbie in 1943, and motorcycle champions Jimmie Guthrie in 1897 and Steve Hislop in 1962. Those born in Hawick are known as 'Teries', a name said to originate from the war-cry of the town's men at the Battle of Flodden in 1513, 'Teribus ye Teri Odin'. The dialect of Scots spoken by locals is sometimes referred to as 'Teri talk'. The Italian Vincenzo Lunardi (1754 - 1806) was presented with the freedom of the town and had a dinner hosted in his honour after his remarkable 110-mile (177-km) balloon flight from Glasgow to Hawick in 1785. The Borders Abbeys Way passes through the town.